← 28. Ramblings on the Rhone. Our two week stop at Aramon ended up costing us 260 Euros (!) but it had provided us with a fabulous, quiet river mooring and easy access to places of interest. On our return from lunch in Uzes, we found that Mimi and Patrick (Eole) who we first met in 2010 and had crossed paths with once or twice since, were moored up behind us. We shared stories on deck in the evening and my spoken French got a good practice. Paul and Jean arrived the next afternoon and were soon chilling out on deck. The swimming was great but sadly the fish weren’t biting, so the following morning the chaps drove to nearby Tarascon for some quality bait and new feeders. We all met up in Aramon for lunch in the small restaurant that Peter and I had already visited the previous week. This was despite the ‘Formule’ lunch on that occasion being so garlicky that even my eyes were watering. This time we all had the Catalan Burger with frites which was delicious. A brief visit from Sue and Allan (‘Whisper’) late afternoon was followed by more aperos onboard ‘Eole’, where Patrick proudly showed us his fine ‘air’ and ‘carnivorous plants. So much for a quiet day! 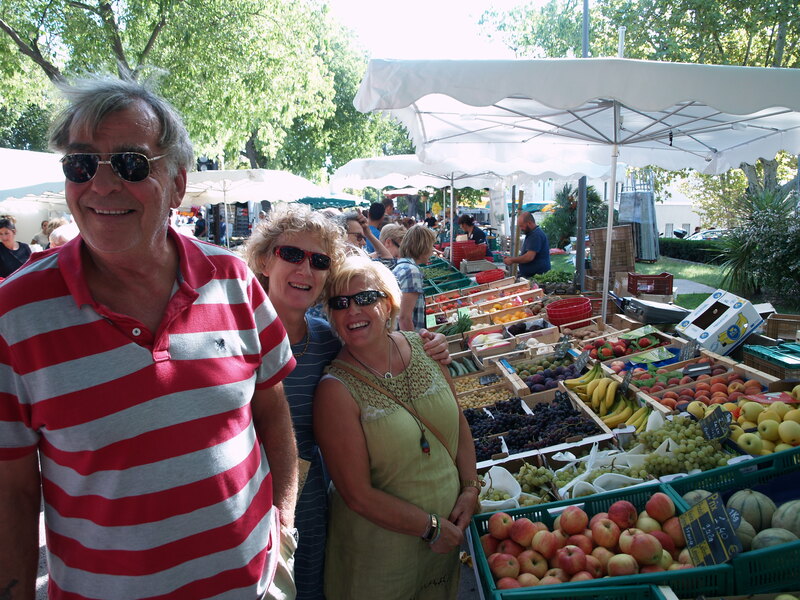 We couldn’t miss the Arles Saturday market and although it was not quite as good as we remembered, Jean bought a colourful bag and we both ‘splashed out’ on a 6 Euro dress as well as some fruit and veg. Peter and Paul found an Irish bar to relax in with Guinness, Confit Duck and Dauphinois Potatoes to enjoy – so everybody was happy. A quick stroll through the market until Paul and I find something better to do ! Next stop was Van Gogh’s bridge and it was better signposted than eight years ago and still recognisable as the one in the painting, even though it has been moved a few meters to make way for a road bridge. An iconic spot if you are an art lover. 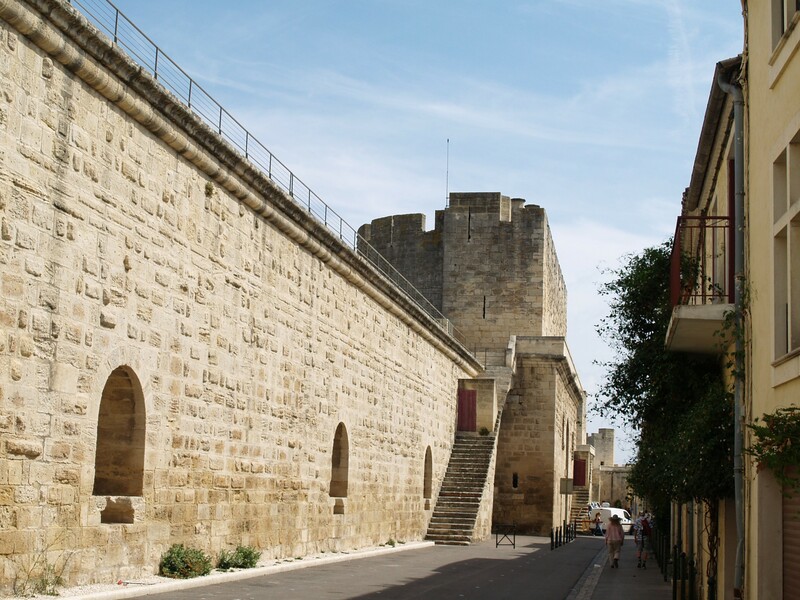 We also decided to stop at Tarascon and visit the castle there and were delighted when the entry was free as part of a special tourist weekend in the area. 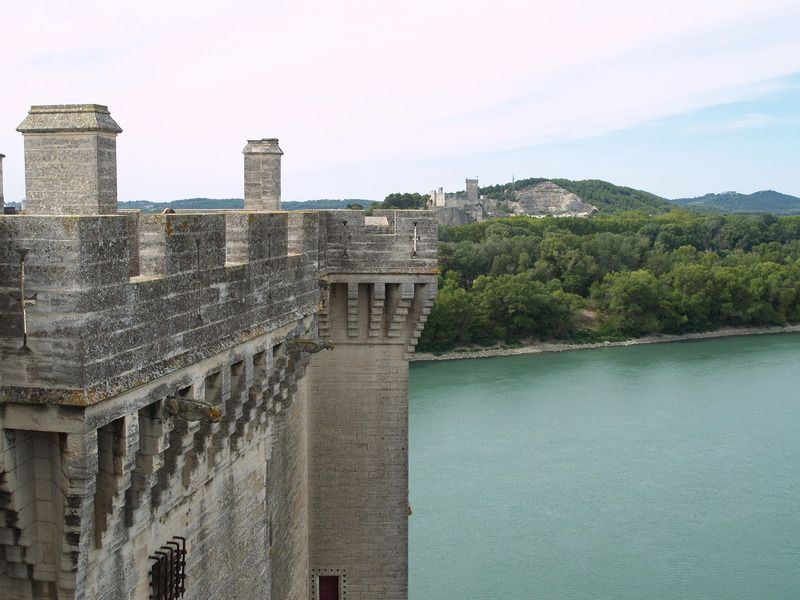 It is an interesting place with ramparts that extend over the banks of the Rhone and excellent panoramic views. 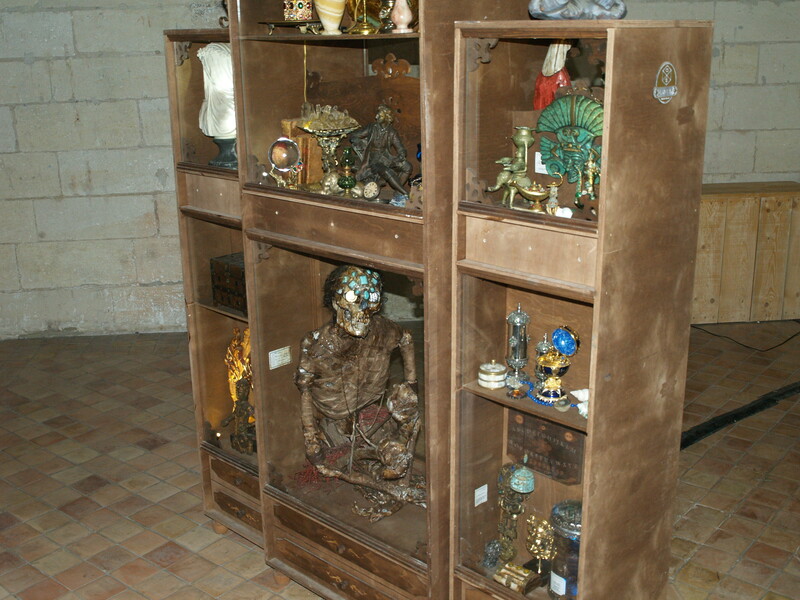 The interior is well preserved and on our visit had various ‘Cabinets of Curiosities’- certainly rather odd exhibits. 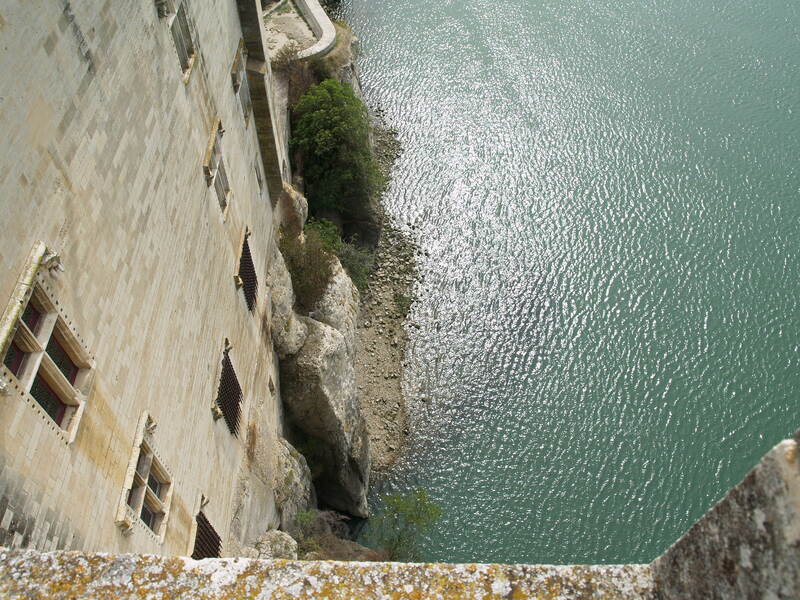 Looking down at the Rhone. 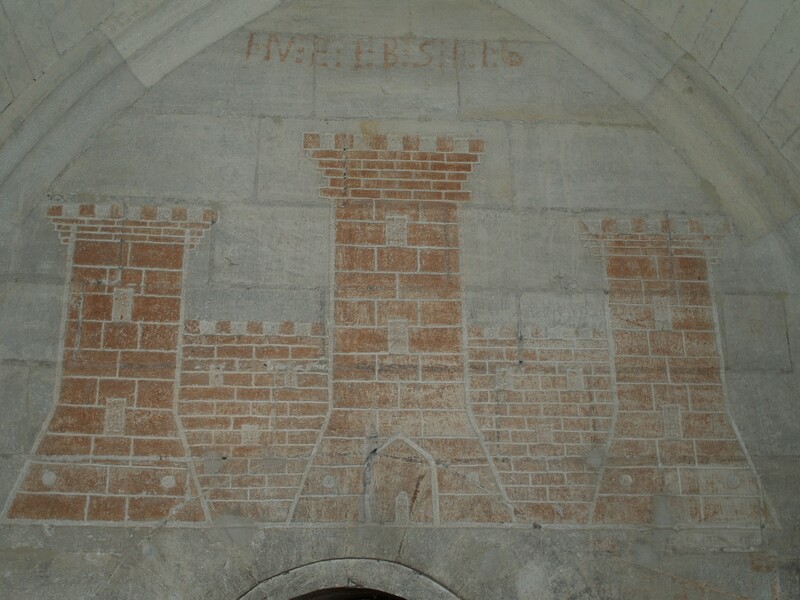 The castle had been used as a prison on occasions and the carved ‘graffiti’ by the inmates was very interesting. A decorated human skeleton exhibited ? Seventeenth century graffiti, rather more pleasing to the eye than today’s! Our final day at Aramon was useful for dropping a car to the Canal du Rhone a Sete, which we would cruise to the next day and doing the remaining washing. The chaps each lost a good fish- well at least the new bait and feeders were working- and we enjoyed a barbecue on deck as the sun set in splendid reds behind us. After an early start, well 9am is early enough for me – we set off for the new mooring that Sue and Allan had told us about and moored up late afternoon. Strangely the 150m plus long mooring was ‘Plaisanciers’ at one end and ‘Commerciales’ at the other, but we were there alone. 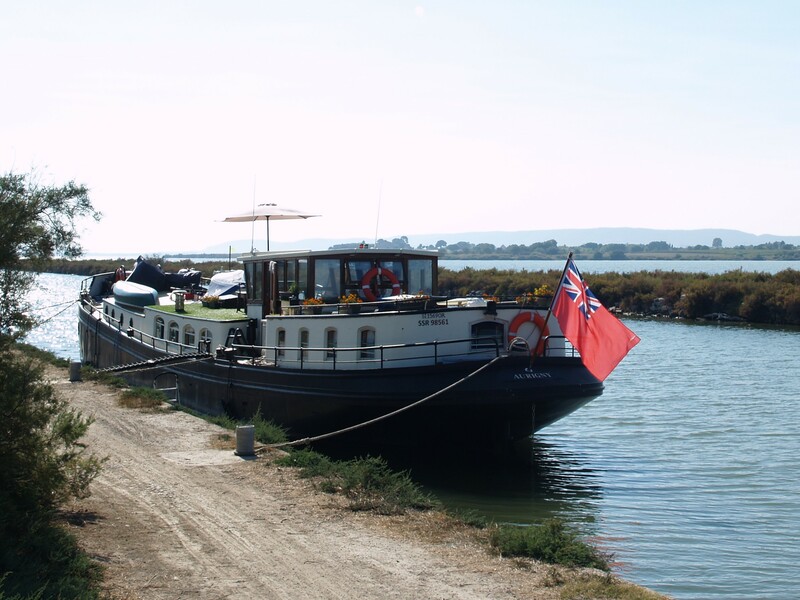 The chaps picked up our car and having wended their way back to the barge by a circuitous route (owing to the watery nature of the area) we set off for Aigues Mortes. Another pretty town we had visited before. Very pretty walled town with its many pedestrian walkways. The next day, Paul decided to take his car ahead and recce the moorings. During the first couple of hours, the scenery was a bit ‘samey’ with a lot of hedging and canal-side construction work in evidence. 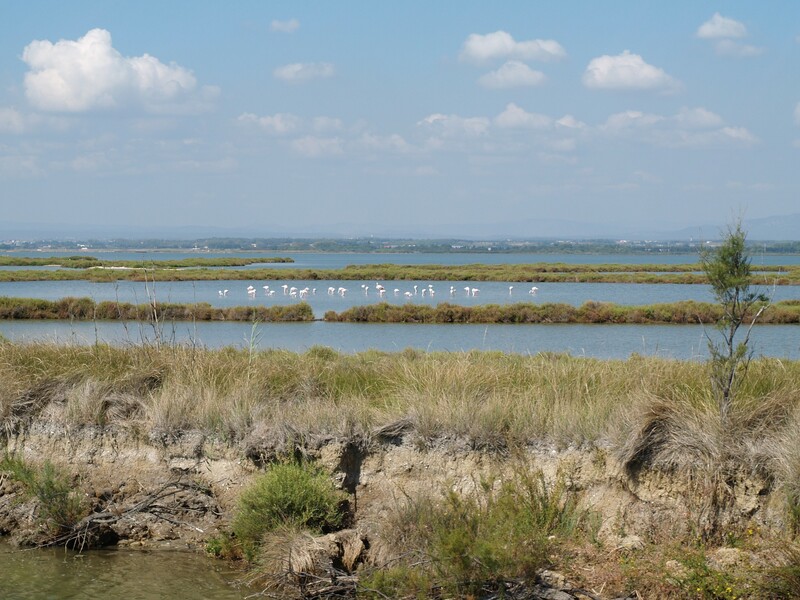 After we caught up with Paul at Palavas-les-Flots, we found ourselves in more open countryside – the Camargue – with flocks of flamingoes just visible in the distance on the various lakes that the canal passes through. 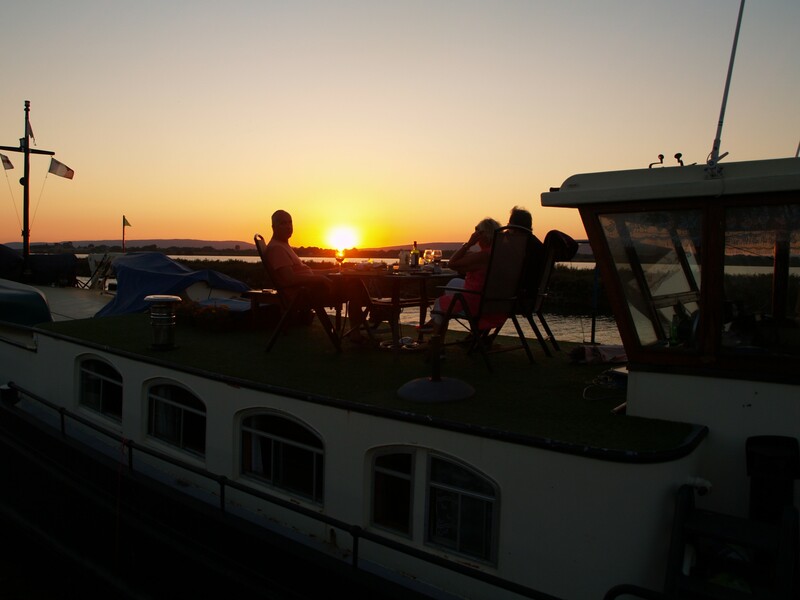 One of our favourite mooring spots was ahead- Villeneuve-les-Maguelone. It had been a welcome stop during our first year when Kate and the family had joined us, the children and their aunty desperate for some beach time. The footbridge was the same, driven by an outboard motor to open when a boat sounded its horn. Moorings were plentiful, if slightly sloping (requiring tyres to be dropped) and once Paul had joined us with the vittels, Peter cooked Moules a la Creme which we enjoyed on deck. The idyllic sunset was just as we had remembered it. Just before Peter joined me a woman walked past with three dogs and a goat…! Warm enough even for me ! 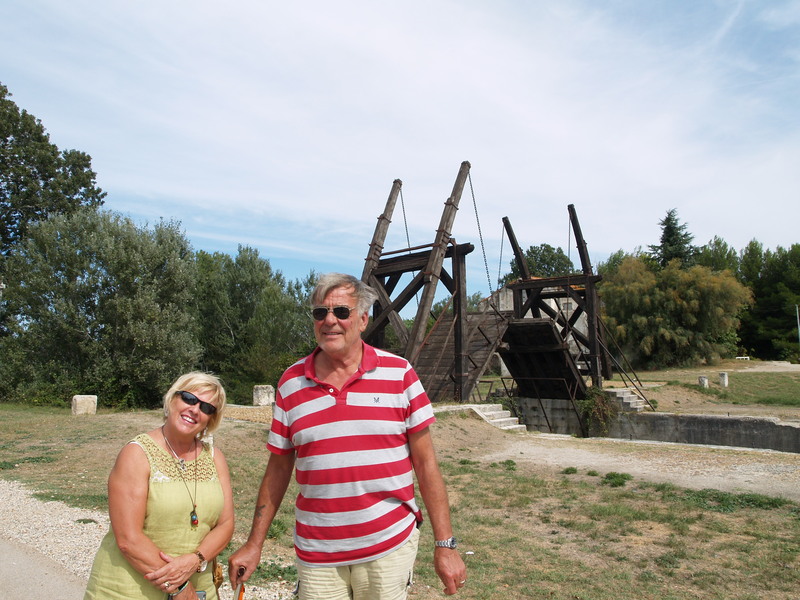 Meanwhile Paul and Jean had driven to Sete to see the views from the top of the town, which is well worth it if you have transport. 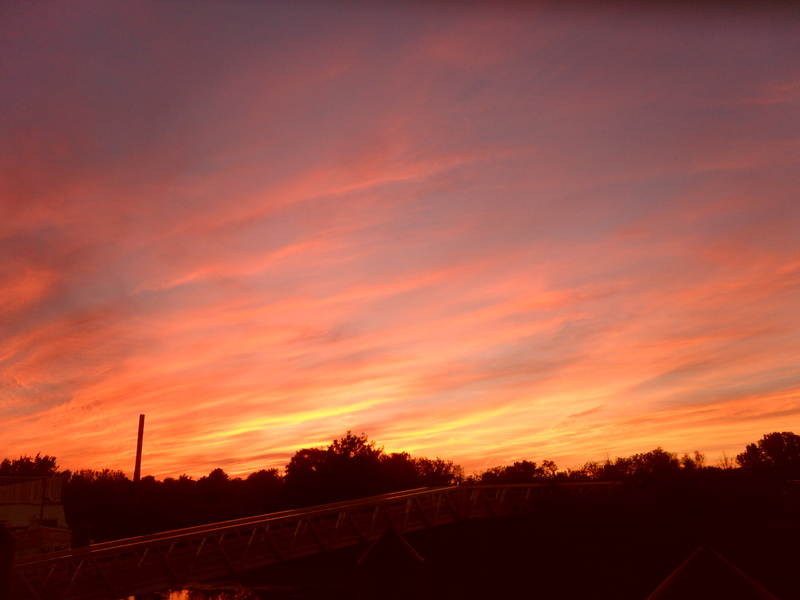 We enjoyed another barbecue and lovely sunset that evening. 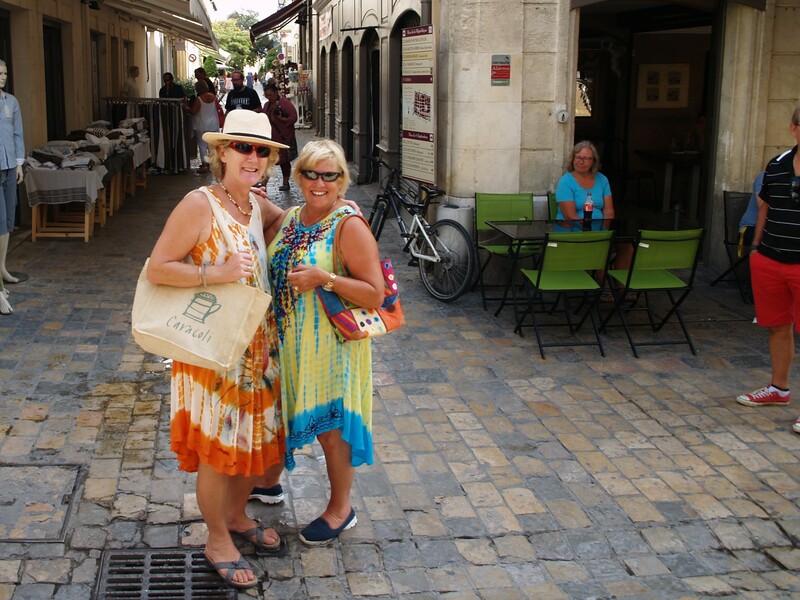 The next morning we drove to Palavas-les-Flots and just caught the tail end of the market where Jean bought a sun hat. The chaps then resumed their boules competition in the nearby boulodrome while Jean and I headed to the beach. 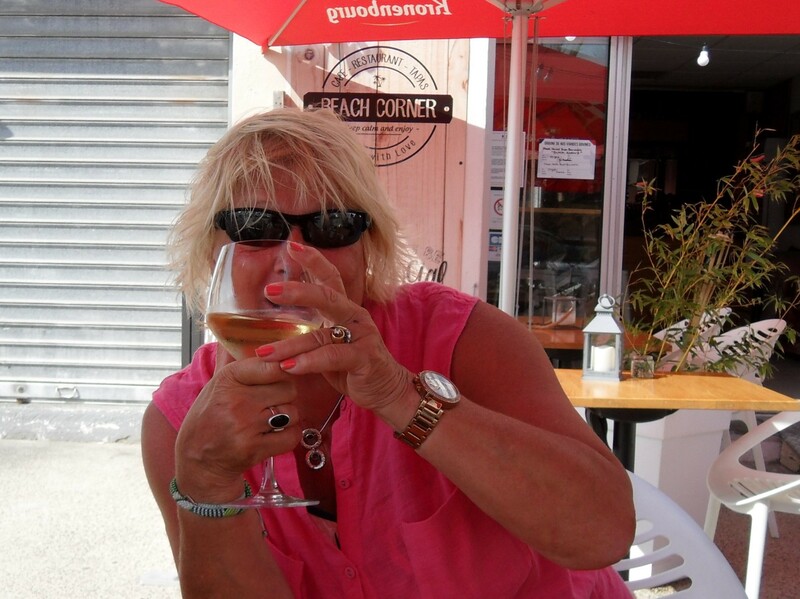 With the wind picking up – something we have noticed a lot in the south- we left the beach and found a bar that sold lovely white wine. The chaps joined us for a beer or two and then we returned to the barge before the bridge closed to foot passengers at 7pm. Jean protecting her wine after Paul and I had a taste ! The next morning Paul drove ahead to Frontignan and we set off on the barge. We passed our old neighbours Chris and Bob on ‘Sassi’, but only managed a quick chat ‘en passant’. 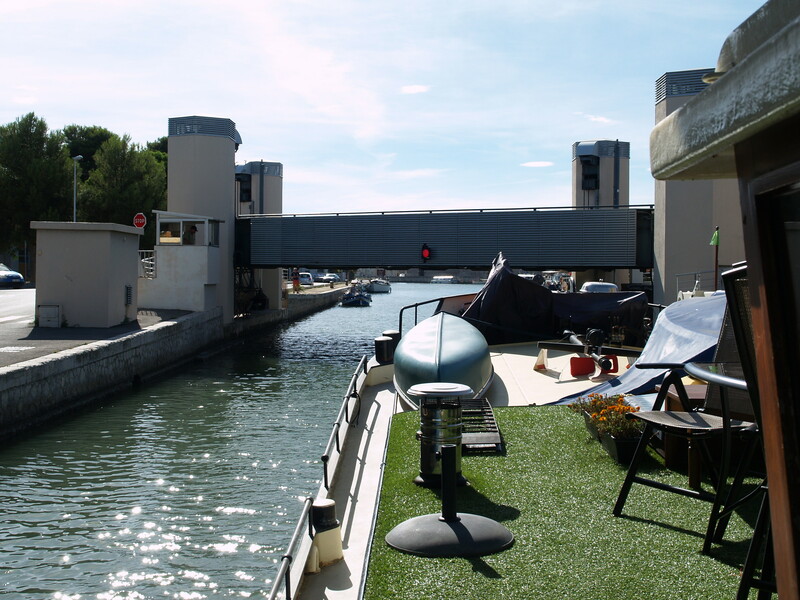 At Frontignan, we moored on the left and then passed under the lift bridge at 4pm into the port. This is now managed by the Bridge master, who quickly turned up once it was back down to ask us how long we were staying. Three nights is now the maximum and mooring is free. Water (100L) and electrics (ours lasted >three days) is a 2 euro jeton each, payable by card at a machine on the quay – how sensible. First in line as the bridge lifts. The splendid weather was holding and we really felt ‘en vacances’. 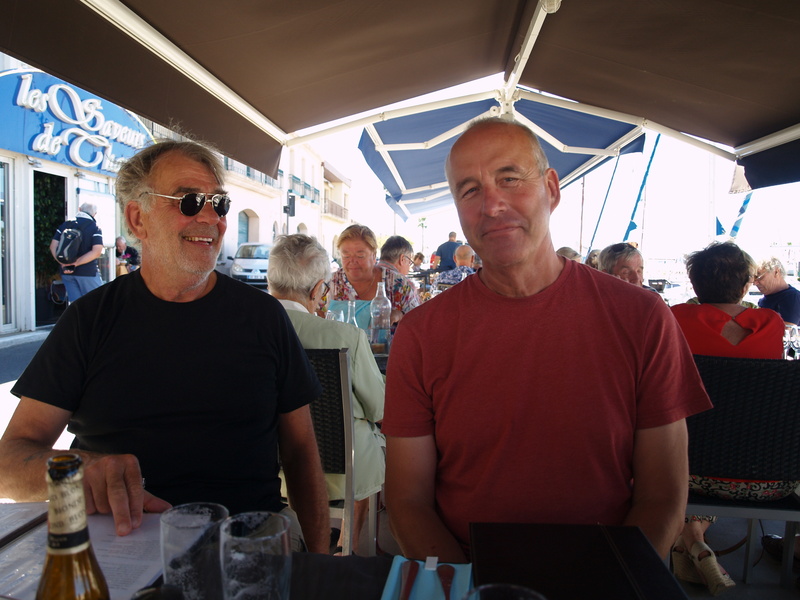 While the chaps picked up our car from Villeneuve-les-Maguelone, Jean and I walked into town and had a coffee in the square. 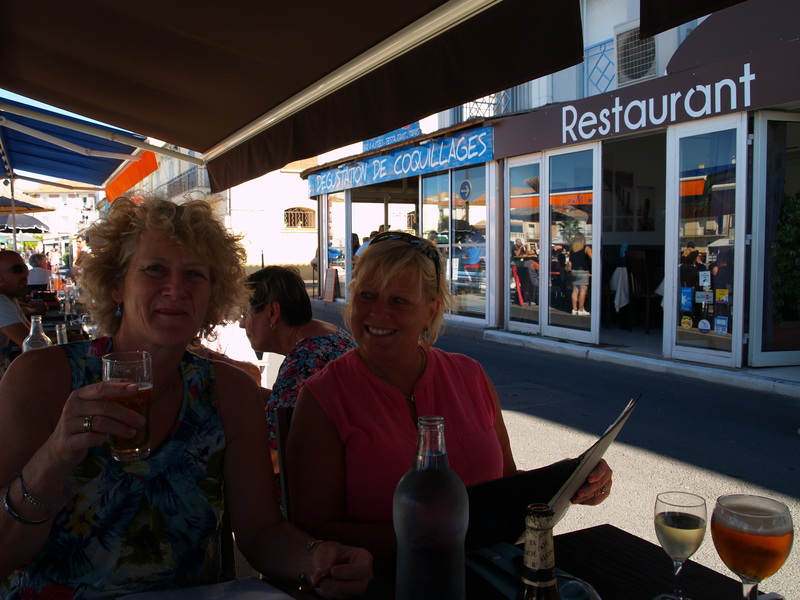 As it was their last day, we drove to Meze on the Etang de Thau and were treated to a fabulous fishy meal at the side of the port. Everywhere was busy with Sunday lunchers. 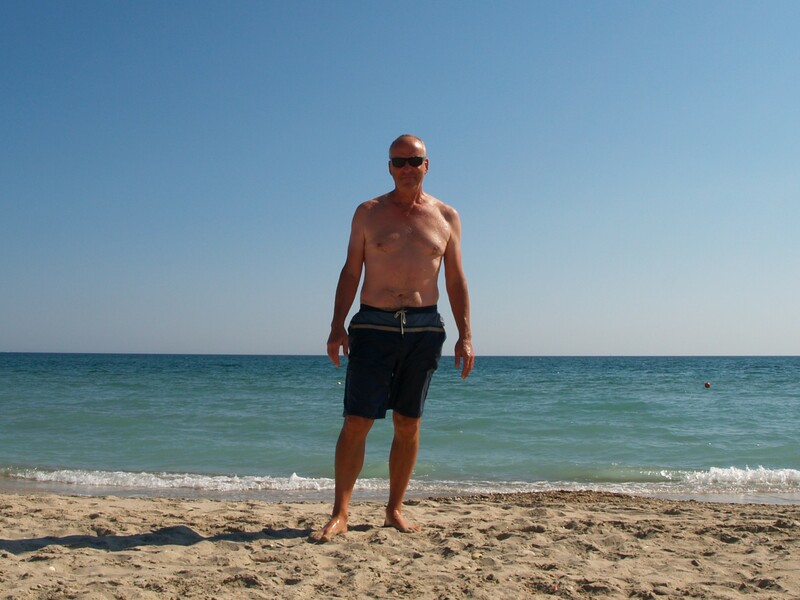 The beach beckoned, so Jean and I drove to one of the Frontignan Plages while the chaps played more boules. That evening, despite the night drawing in, we sat on deck until gone 10.30pm in warm temperatures. It was probably our last really summery evening. They left mid morning and I spent a few hours getting ready for Karen’s arrival the following day. A late trip to the beach was lovely for a swim but rather too breezy for a sun bathe. We now had to find somewhere suitable to moor while Peter went away on a motorcycling trip for a few days later in the week.